Ideal for olympic level athletes, sprinters, roller-skiing, roller-blading, wheelchair exercise, multi-person use. Recommended room height is 12 feet (366 cm). Standard Features: Front & side rails, 8-inch side platform, emergency stop button & manual (non-programmable) controller. 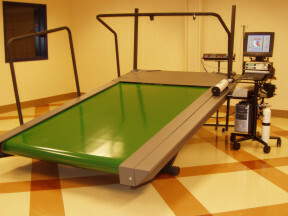 (Controller mounted on or off treadmill). Use TurboFit Exercise Manager software for programming. Motor: 5 HP continuous duty, 240V/3-phase power/30 amp. TurboFit Exercise Manager Software: Optional Windows-based software provides PC-control and creates custom workouts and graphs and records watts, heart rate and many other variables. TurboFit software can be used with both manual or programmable controller, RS232 option required.